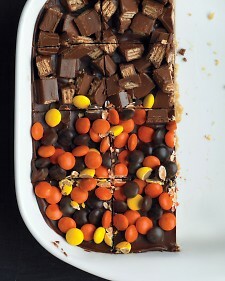 Use up leftover chocolate candies and candy bars from the kids” Halloween haul to create these crumbly shortbread bars. 1) Preheat oven to 350 degrees. In a large bowl, using an electric mixer, beat butter, brown sugar, and salt on medium-high until light and fluffy, 3 minutes. With mixer on low, add flour in three additions and beat until combined (dough will be crumbly). Press dough evenly into an 8-inch square baking dish. Bake until golden brown and firm, 30 to 35 minutes. 2) Scatter chocolate chips on top of shortbread. Bake until soft, 1 minute. With the back of a spoon, spread chocolate evenly over shortbread. Scatter candies over top. Let cool on a wire rack 30 minutes. Refrigerate briefly to set chocolate, then cut into 16 bars. Η σελίδα δείχνει cache εκδοχή (στιγμιότυπο) περιεχομένου συνταγής από το public domain: http://greatcakerecipes.blogspot.com/2012/10/shortbread-candy-bars.html. – Μεταβείτε στην πηγή με το σύνδεσμο: Great Cake Recipes http://greatcakerecipes.blogspot.com/2012/10/shortbread-candy-bars.html.